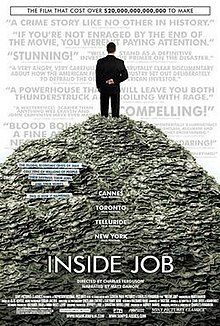 Like all good documentaries, Inside Job covers its material with a strong sense of narrative. This helps make the material, in this case the causes of the Global Financial Crisis of 2008, more accessible to a general audience. Starting out with the sorry tale of Iceland and its financial collapse, the film unfolds the layers of complexity of world financial markets carefully and skilfully, tracing the growth of new types of financial instruments developed off the back of massive brain and computer power from the 1980s onwards. We see the unfettered influence of the creators of those money-making schemes over US politics over the last thirty years, and the resulting failure of the US and other Governments to develop a regulatory framework to support the orderly operation of these new markets. Some have described it as a horror movie masquerading as a documentary, and there are plenty of villains to get the steam coming out of your ears. Of course, some viewers might have steam coming out their ears at points where they think the film takes an unduly biased stance. Hey, feel free to make your owm film about it all. Don’t be deterred by the subject matter – this is a film for everyone, beautifully made and carefully laid out. Those who want to read more deeply on the subject could try The Great Hangover (edited by Graydon Carter), a collection of articles from Vanity Fair. This is also a good recent article on the broader issue by Australian journalist Ross Gittins: The Four Business Gangs that Run the US. “Lift music is okay in lifts,” I thought to myself as I assended into the lofty heights of the tower to start my first day at work. Unfortunately, this building subjected its workers to the scourge of piped music in the work area as well. Fortunately, it wasn’t Mantovani plays Abba ALL day – the music came and went around the floor in 15 minute intervals. I guess there was research that concluded that this would squeeze the last drop of productivity out of those subject to the intrusion. For the first few months, the music came and went at a volume that was only noticeable if I was daydreaming. Let’s face it, that wasn’t never. It was my first job, I had no idea what I was doing, and that mattered. It all went sour when someone on the other side of the floor got a promotion. This high flying team leader was now entitled to a cupboard-sized office. The trouble was, it was only after she was ensconced in the new centre of power that she realised that the nearest musak speaker was a tucked away beside her office, very much out of ear shot. It must have seemed perfectly reasonable to her at the time. She contacted Building Management, and late one afternoon arranged for the one volume control for the whole floor to be increased so she could hum along happily inside her office. I was on the phone to a client the next morning when we were hit with our first musak onslaught. I nearly dropped the phone in shock, but it made no difference as neither of the connected parties were now able to communicate effectively. Things were slow in the area next to mine, and when the musak stomped over to their area, several wags hid under their desks until it was over. After the storm had passed, we gathered together as I imagine people do after an air-raid or earthquake, with bemused “What was THAT?” looks on their faces. Our boss’s PA went straight into action, and by the next rotation, things had returned to normal. On the other side of the floor, and unbeknown to us, our newly appointed team leader friend soon realised her musak tonic had disappeared, and was onto Building Management again like a shot. The volume yo-yoed over the next few days, and it took ages to work out who was behind the requests to increase the volume. Ear-muffs started to appear on desks for self protection. It was at this point that senior management became aware of the issue, and resolutely took no action. After 10 days, the poor guy in Building Management was heartily sick of being constantly contacted to adjust the musak volume. It was fortunate there weren’t any emergencies, as he simply stopped answering his phone. The afternoon on that second Friday was dragging, and the liquid lunch that had been called earlier had not yielded any revised tactics. I was bracing for our next onslaught when the guy next to me caught my eye, made a quick “snip snip” action with his fingers, and a simple plan was hatched. We waited until after five, and nonchalantly lifted my desk on top of his. Well, we tried to do it nonchalantly, the desk weighed a tonne but it least it was unadorned with technology. I braced it while he climbed to the top, lifted the ceiling panel, snipped the speaker wires, returned the panel and climbed down again. It was done in 40 seconds. Friday night drinks were well under way when we arrived, and secretly toasted our success. Little victories are sometimes the sweetest. It has been said that the winners write the history. Sometimes you wonder if Enron – The Smartest Guys in the Room is crossing the line in its editorial stance, but in the end, the strong narrative of what went on at Enron wins the day. It is a chilling and enthrawling thriller of how a successful company dressed itself up to be even more successful using increasingly deceptive techniques. In 2001 it went from being the 6th largest corporation in the world, to bankrupcy. The film is a fascinating human drama as well as a cautionary tale about capitalism at its worst – unbridled greed and moral bankrupcy at the individual level. It’s hard to work out who comes off looking worse – anyone responsible for the accounting standards that enabled the Enron fraud, the guys who saw it early and jumped ship while their shares were still worth something, or the self deluded senior execs who stayed to the bitter end. 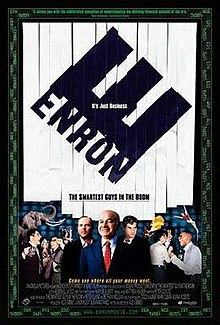 One of the most chilling scenes in the film is a video of senior leaders telling staff to keep their 401K pension fund investments in Enron shares. Anyone who followed that advice not only lost their job but also their retirement savings. It is one of several places where you might have to restrain yourself from yelling at the screen in frustration at the injustice and tragedy of what went on at the hands of greedy corporate leaders. On a side note, this was the first film shown at the West Pymble Thinking Person’s Film Festival, and was followed by Margin Call, with Moneyball set to play next. 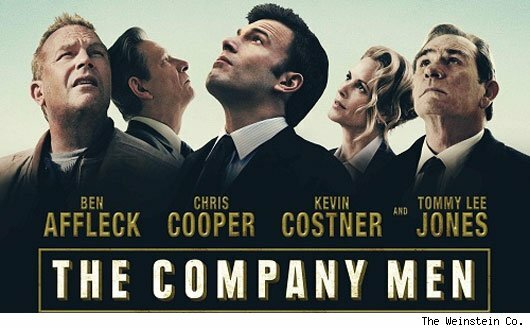 The Company Men opens with Bobby Walker (Ben Affleck), being sacked from his high-flying sales job, and getting about one-third of what he’d get if he was made redundant after twelve years of service in Australia. The plot is driven forward by his struggle with his own self perception as breadwinner and family man, as he and his family are forced to give up the trappings of his previous “success”, painfully, one by one. Bobby eventually finds a sense of community with his fellow occupants of the soul-destroying cubicle farm at the outplacement agency as his job search grinds fruitlessly on. His prickly relationship with his builder brother-in-law (Kevin Costner) reaches a point of mutual appreciation towards the conclusion of the film, while steering clear of white collar versus blue collar class struggle cliches. Bobby’s former boss (Tommy Lee Jones) is fighting the good fight for the voice of reason and compassion within the company as it lurches from one crisis to another, but ultimately he and other long time employees are let go by the man he co-founded the company with all those years ago. The sense of bitterness and betrayal is palpable – Tommy Lee Jones gives a stand-out performance. The film ends with some glimmers of hope emerging from the struggle and tragedy of the men who lost their jobs, but there is no neat comeuppance for the villain. Less brutal that Margin Call, this is a well crafted story, focussing on the human stories, rather than financial ones, emerging from the financial crisis of 2008. To receive regular email updates about my writing, sign up here. Every new subscriber gets one of my ebooks, free! Over the weekend, Peter decided to go ahead with his plan to attack National Civic Bank. On D-Day, Dexter and Peter left their respective homes each armed with a mobile phone with a prepaid SIM, and a new netbook with prepaid wireless modem. Peter caught the train to Strathfield, and at 9.20 rang the audience line for shock jock Adrian Andrews, calling himself Murray. “Well, Murray, that is interesting.” Adrian looked at his producer who shook her head. “There are no reports about National Civic in the press this morning. Maybe it’s pension day?” Adrian finished the sentence with his trademark chuckle. Meanwhile, the station research analyst got straight on the web to see what they could find out. Before anyone could ring in to say there was actually no crowd at Strathfield, there was already another call queued up. “Yes, Adrian, in Hornsby. They’ve just opened and the queue goes out the door.” Peter laughed as he listened to this on air. Dexter was clearly using something to disguise the voice and make it sound older, but it was obvious that Dexter was a “she”. As soon as she got off the phone, Dexter launched the denial of service attack on the NCB website, flooding it with login requests that made it almost impossible for anyone to log on. At the same time, Peter set in motion a similar remote phone attack on the radio station, bombarding their switchboard with calls that made it look like they were receiving hundreds of calls. Once that was in place, he set in place a similar attack on the main customer service phone number for NCB. Peter had hacked a couple of high profile Twitter accounts, and kicked things along with some deliciously ambiguous tweets like “Why is everyone taking their money out of @NCB?” and “Selling down @NCB shares – not sure what’s happening there”. 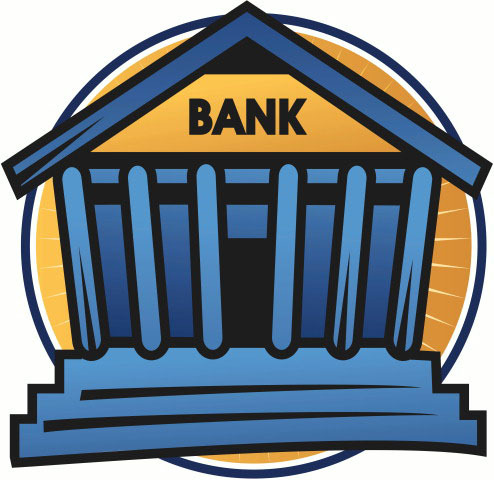 By ten fifteen NCB was top of trending topics in Australia, so word that the bank was in trouble was out. NCB weren’t able to decide on the right message to put out on their twitter feed until mid-afternoon, by which time it was too late. By ten-thirty there were queues forming at most branches, and although Dexter had withdrawn the attack on nationalcivic.com, the traffic from real customers was now keeping the site locked up – and did so for the rest of the day. NCB shares were suspended from trade on the stock market at the company’s request by eleven, having fallen thirty percent. High above the city, with the lights and the harbour sitting peacefully on the other side of the glass, the Board and senior management of NCB were assembling in the boardroom. Normally a pristine testament to process and propriety, the room was covered in papers and filled with whiteboards. The detritus of food eaten in haste through the day lay about. No one seemed to care. They were there for only one reason – to hear the Director of Security’s report. “Untraceable? I don’t believe you – how can someone almost make a bank collapse and not leave a trace?” Clearly, the Chairman had been hoping for more. There was silence as the information sank in. The Director of Security nodded and left the room. He had a sinking feeling that his presentation had not gone well. 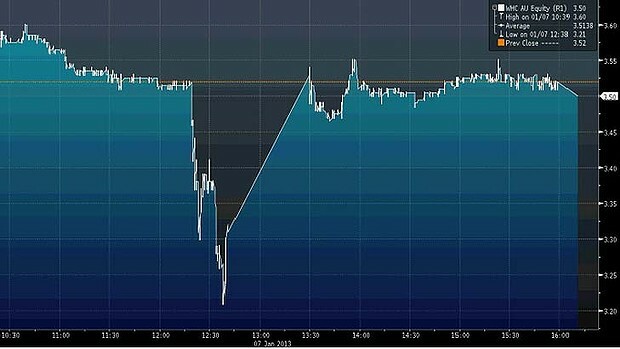 It is going to be interesting to see how this pans out, with the alleged hoaxer facing big trouble with the corporate regulator over misinformation and market manipulation. The motives here seem straighforward, but imagine what could be achieved with some co-ordinated effort and a genuine attempt to conceal the source of the hoax. There are a couple of fictional “attacks” like this perpetrated to achieve the specific objectives of the shadowy people behind Queenberry Foundation in The Queensberry Rule. Check it out!